12 1/8 x 4 7/8 x 4 7/8 in. 10 1/4 x 9 1/4 x 9 in. 4 x 8 1/8 x 8 1/8 in. 24 3/8 x 5 3/4 x 5 1/2 in. 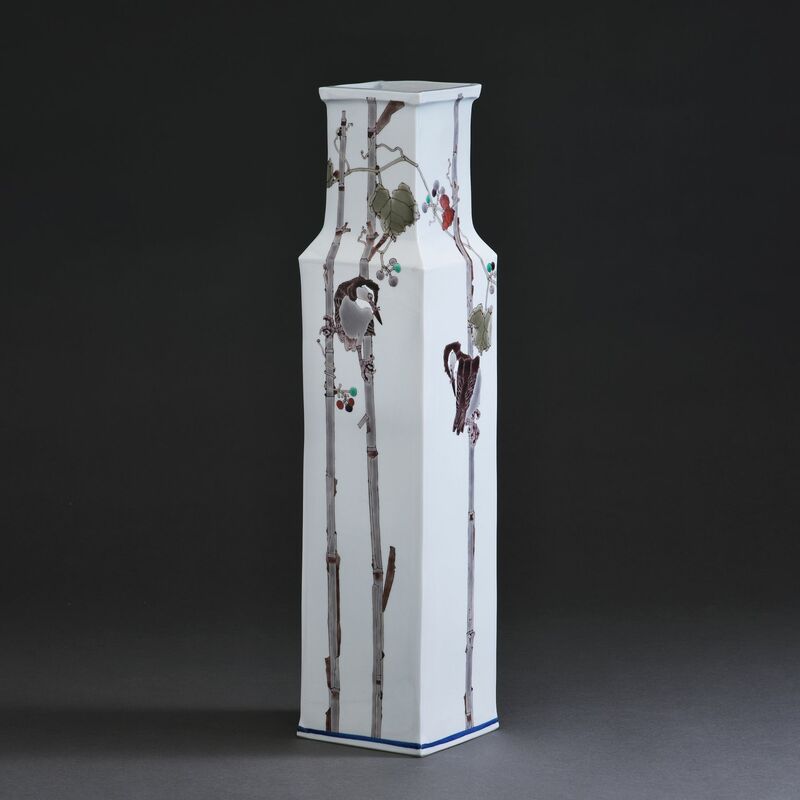 NEW YORK – The first-ever joint exhibition of the two celebrated and innovative ceramic masters, Takegoshi Jun and Nakamura Takuo, both inspired by traditional kutani ware, will open next month at Joan B Mirviss LTD. Titled Beyond Kutani: Innovation in Color and Form, the much anticipated show will feature both functional and sculptural forms, all boldly decorated with polychrome under-glazing and overglaze enamels. 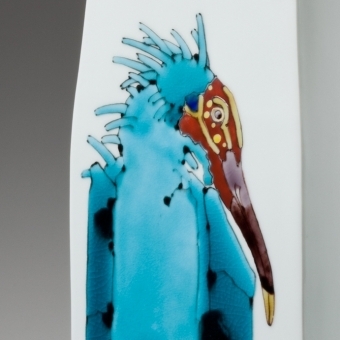 Drawing from the traditional ko-kutani palette of emerald green, mustard yellow, peacock blue, brick red and eggplant purple (go-sai) that is further heightened with a vast array of colorful and metallic glazes derived from classical rinpa decorative traditions, these artists cover their white porcelain or white and red stoneware surfaces with designs based on ancient literature and painting with a strong to nod towards nature. 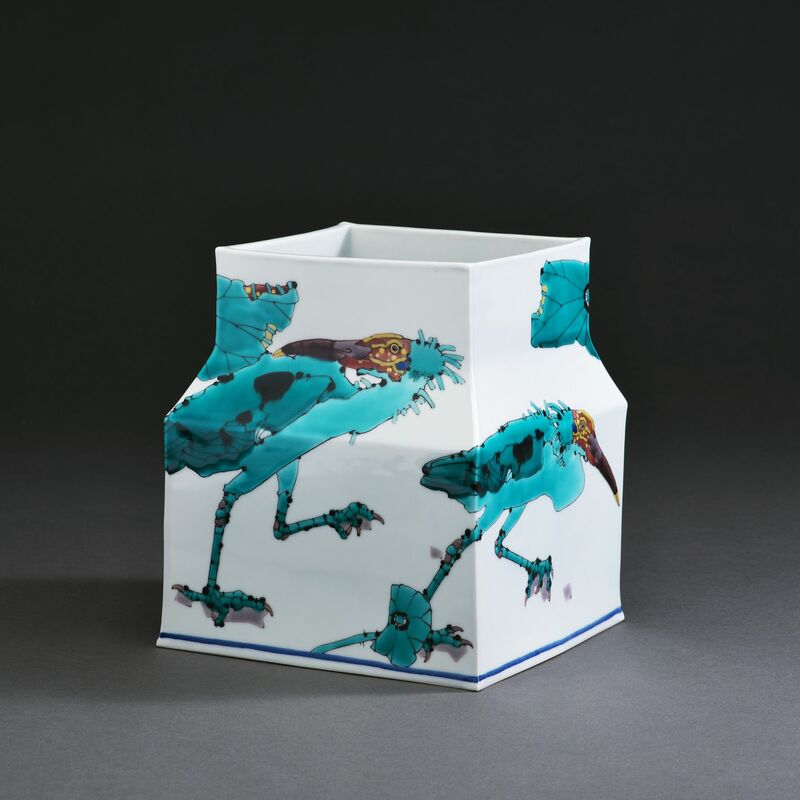 Featuring over 40 new works created expressly for the occasion, this exhibition will highlight these two ceramists’ unique and divergent aesthetics, both developed in response to time-honored kutani artistic traditions but cast in very contemporary modes. TAKEGOSHI JUN ( or Taizan IV; b. 1948) was born in Ishikawa Prefecture, where kutani has flourished for centuries, and was trained in the traditional techniques of his family by his father, Takegoshi Taizan III (1919-1984). Following studies at university of traditional nihonga painting, he returned to the world of porcelain with the eye and brush of a painter. 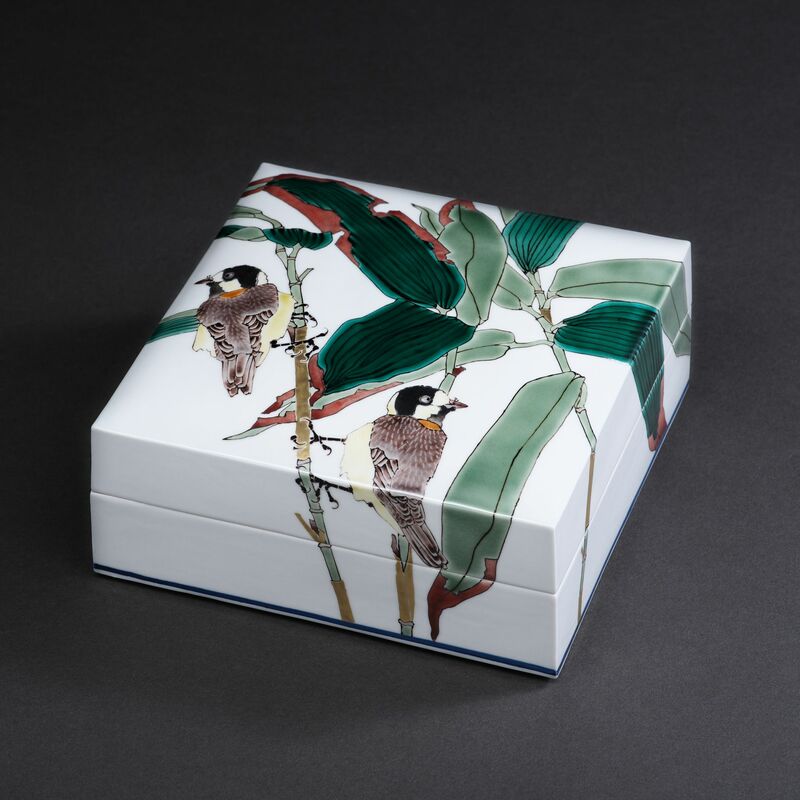 Takegoshi treats his forms as three-dimensional canvases by painting their surface decoration with rich, jewel-like polychrome enamels with designs inspired by nature. 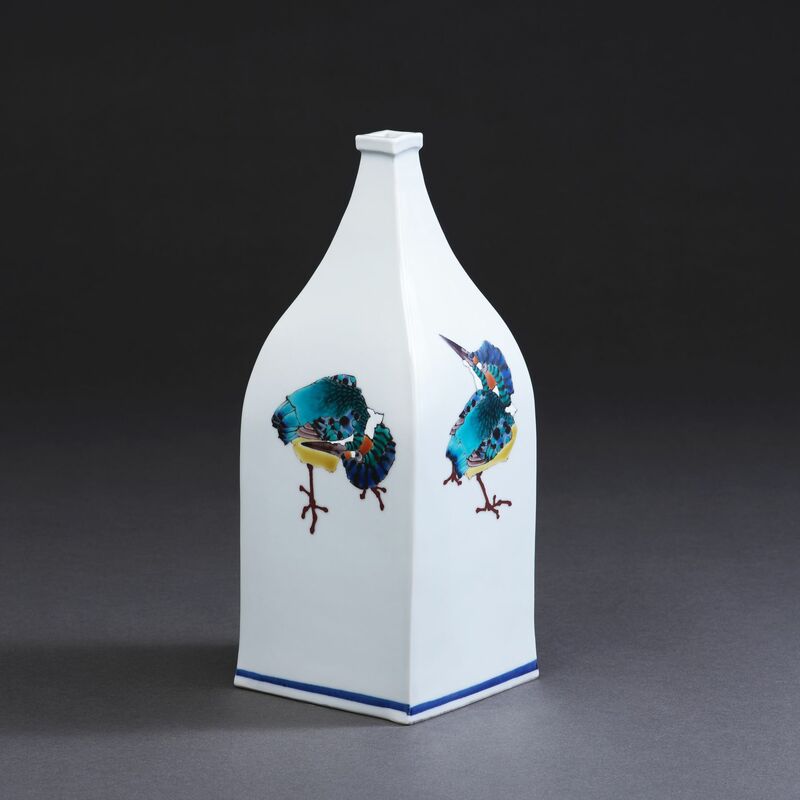 His delightful, often animated, depictions of birds, flowers, and plants complement and accentuate the form of each vessel. Takegoshi’s unique glazing and unusually high temperature firing techniques combine to produce the appearance of light emanating through his glazes, creating both translucent and opaque effects on his porcelain surfaces. He was the recipient of the prestigious Japan Ceramic Society Award in 2006 and his works grace important Japanese collections and museums as well as those in the West, such as the Metropolitan Museum of Art, NY and the Philadelphia Museum of Art, PA.
Joan B. Mirviss has been a distinguished expert in Japanese art specializing in prints, paintings, screens and ceramics for forty years. She is the leading Western dealer in the field of modern and contemporary Japanese ceramics, and from her New York gallery on Madison Avenue, JOAN B MIRVISS LTD exclusively represents most of today’s top Japanese clay artists. As a distinguished, widely published, and highly respected specialist in her field, Mirviss has advised and built collections for many museums, major private collectors, and corporations. For further information or images, please call 212-799-4021 or email joan@mirviss.com.